Estrella Mountain Ranch is about 17 miles from downtown Phoenix on Estrella Parkway in Goodyear. It provides a lakeside mountain oasis nestled in the Sierra Estrella Mountains, along the Sonoran Desert Valley. Estrella currently offers more than 500 acres of parks and open space including 72 acres of lakes for boating and fishing. There is the Starpointe Residents Club, hiking trails, bike paths, basketball, volleyball, pickleball and tennis courts. Estrella is home to a Jack Nicklaus-designed Championship golf course, The Golf Club of Estrella. Estrella Mountain Ranch offers state-of-the-art amenities in a resort-inspired setting. It features a wide selection of homes for first-time home buyers, growing families and empty-nesters. With the addition of an active adult neighborhood, there will be even more options for retirees and snow birds desiring Estrella’s lifestyle. Estrella’s sense of seclusion is enhanced by the adjacent 19,840-acre Estrella Mountain Ranch Regional Park. 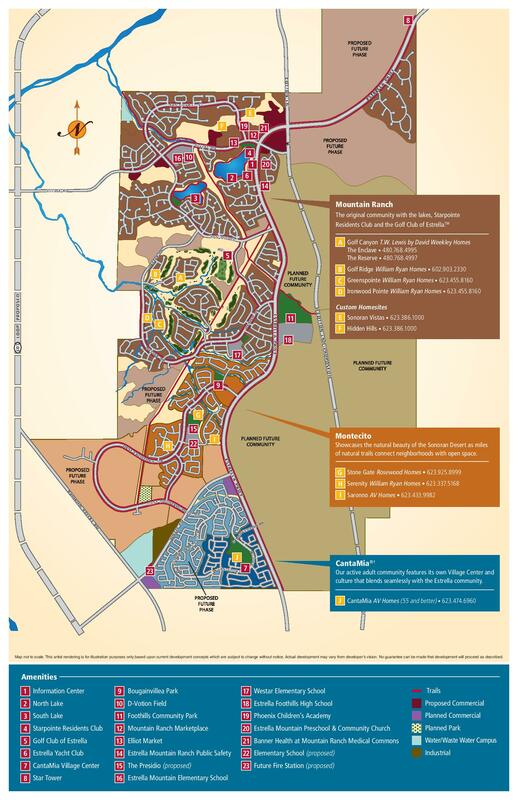 Homes In Estrella Mountain Community Information is your guide to your future in Estrella. For more information on this community or homes in Estrella Mountain for sale, contact John Deutsch today. Surrounded by majestic mountains and wide-open desert vistas, life in Estrella is a masterpiece of harmonious balance; dynamic, yet serene; offering young couples, families and retirees a resort-inspired lifestyle with state-of-the-art amenities. Estrella’s three distinct communities – Mountain Ranch, Montecito and CantaMia(55+) – feature remarkable living with rich architecture, diverse neighborhood streetscapes and inviting gathering places. Estrella is located approximately 17 miles West of Downtown Phoenix in Goodyear, Arizona. It is named one of the five “Most Livable Cities” in America. It is committed to becoming the most desirable destination in the Sonoran Desert Valley. Estrella will eventually offer 50,000 homes. It currently features accessible shopping and services, diverse education facilities, a full calendar of community activities and events spanning every stage of life and opportunities to explore the desert environment. In Goodyear, Estrella features two highly rated K-8 elementary schools-both part of the Liberty District. Estrella Foothills High School is part of the Buckeye Union High School District and was recently recognized by the Arizona Education Foundation as an A+ school. Starpointe Residents Club – The community features an impressive 24,400 square foot Starpointe Residence Club. It was inspired by seaside hotels and elegant resorts. The club features a StarSplash Water Park that is host to two slides. There is a 25-meter heated lap pool, a state-of-the-art fitness center, café, youth club, meeting rooms and outdoor event spaces. Golf Club of Estrella – A par-72, 18-hole championship golf course designed by award-winning Nicklaus Design and managed by Troon Golf. The golf course also features The Players Grill and a golf professional shop. Mountain Ranch Marketplace – This shopping center provides 165,000 square feet of grocery, drug, and retail space. In addition to the anchor tenant Safeway, Mountain Ranch Marketplace includes Walgreens, Chase Bank, Phoenix Children’s Academy. Also, there is Papa John’s Pizza, Great Clips, Oasis Bagels, Subway, Mountain Ranch Dentistry, Estrella Homes and Land, SW Ambulance, Edward Jones, William Ryan Homes and Anderson Institute of Music & Performing Arts. Next door, Banner Health Center, the first building in our Mountain Ranch Medical Commons, is now open. Elliot Market – A community convenience center featuring a general store, soda fountain and service station. Parks and Trails – Estrella’s parks and trails total approximately 20-miles and include nearly 3-miles of paved walkways surrounding the lakes. Smaller parks and play areas are located within most residential neighborhoods. Estrella Yacht Club and North and South Lakes – Estrella boasts two private lakes, North Lake and South Lake, which combined 72 acres. The Yacht Club offers residents complimentary use of a variety of non-motorized boats. They include paddle boats, canoes and sail boats. Both lakes are stocked with a selection of fresh water fish for catch and release fishing.